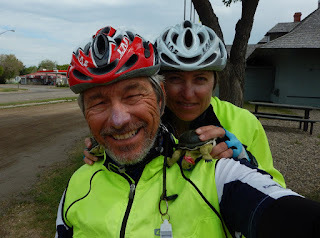 Hélène and Daniel Crossing Canada by Bike from Vancouver(BC) to Ottawa(ON) in 2015. In 2016 we will do Ottawa(ON) to St-John's(NF). We left Regina at 7 am under perfect conditions, sunny, 9 degrees and winds from the WNW at 27 kph. At first, we were on Hwy 1 which runs due EAST so the wind did not offer that big an advantage but once we turned onto Hwy 10, we had the wind to our back. We were able to reach Fort Qu'Appelle 70 km away in 3 hours 5 minutes. That is the fastest we have pedaled since the trip started. We had our second breakfast and did a little walkabout. After 1:30 hours, we got back on the bike heading for Melville. 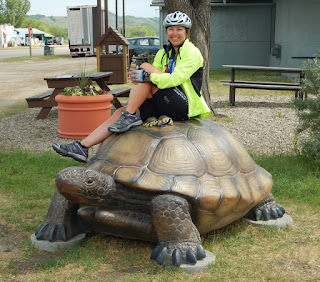 Our turtles visiting with a Saskatchewan cousin. Hélène Helenstill flashing her 70 km in 3:05 hours grin. A selfie of the entire team all still grinning from the morning ride. First order of business, climb the hill out of the Qu'Appelle River Valley. Halfway up the hill, to our left, we noticed 3 Proghorns. If you think these guys came move quickly on the flat, you should see them run up a hill. They were so fast, that Hélène could not manage to get a clear picture. That is unusual as she can whip out that camra in a flash. As we climb the hill, we noticed that the wind was now in our face when less than 2 hours ago it was to our back. While we were having breakfast in the village, the wind turned around 180 degrees. We were now looking at strong headwinds for the next 74 or so km. It took us almost 6 hours to get to Melville and it was our most challenging day to date. Climbing Allison Pass was a lot easier as once in a while the climb levelled out but this afternoon, there was no break from the wind, it was relentless. I checked with Environment Canada once we got to Melville and the winds this afternoon were 27 kph with gusts to 43 kph. No wonder, at times, it felt like we could not make any forward progress. Tonight is our last night in Saskatchewan. We are hoping that the winds will be in our favour tomorrow as we head to Russell, Manitoba. Beautiful hills. When I look at the picture of Fort Qu'Applle , I am thinking western movies, in my head I see horses and not cars :-). Copyright © Hélène Leroux and Daniel Wilson . Picture Window theme. Theme images by MAYBAYBUTTER. Powered by Blogger.